How to make sushi at home - without bamboo mat! 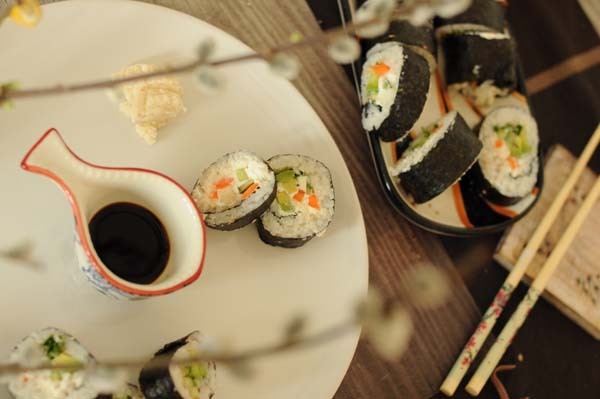 To make delicious sushi at home you need neither special equipment, nor even raw fish – we will show you how to make it in easy 5 steps, and not even a bamboo mat is needed! fillings – avocado, cucumbers, carrots, radish, asparagus, rocket salad and coriander to keep it vegan. Add cream cheese if you like dairy. Use egg omelette, salmon, tuna or chicken if you prefer. Step 1. Rinse the rice three times and boil it until water evaporates. Put it aside to cool down a little. Step 2. Heat vinegar until it starts to boil and dissolve rice and sugar in it. Add the mixture to the rice and mix throughly. Do it in a big bowl in which you can spread the rice nicely. Step 4. Cut your fillings into long chunks and place them on top of rice in one row. Using the kitchen towel roll them in a tight roll. Step 5. Cut your sushi in pieces with a sharp knife and serve!It goes best with soya sauce and spicy wasabi on a side! Learn how to cook sushi in Japan!